WHY USE AERATION SYSTEMS FOR PONDS OR LAKES? Professional pond and lake managers have a number of scientifically proven tools to properly manage eutrophic water bodies (ponds or lakes that are overly rich in nutrients and minerals that induce excessive plant and algae growth). One of the most widely used and versatile tools in their toolbox is the aeration system. 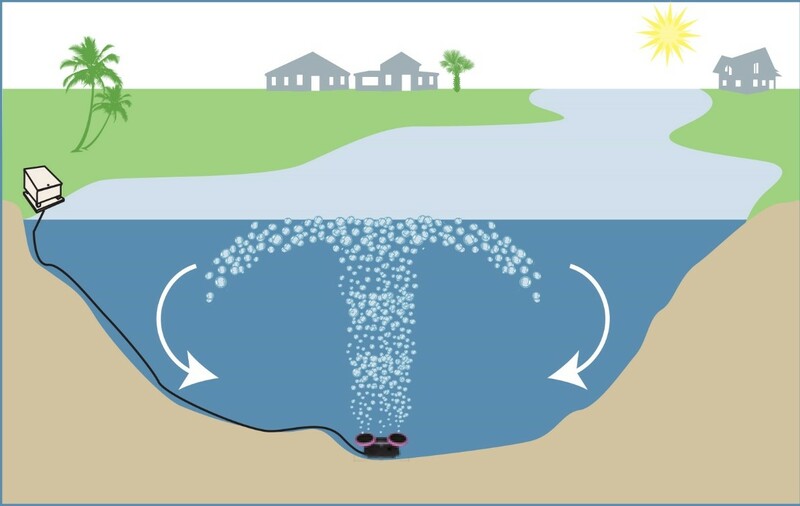 Aeration is the process of pumping compressed air into the bottom waters of a lake or pond. Aeration causes two related but separate benefits that are vital to maintaining a healthy ecosystem. Benefit # 1: Circulation. Water needs to be constantly moved in your lake/pond to prevent stagnation and toxic chemicals from building up. Benefit #2: Oxygenation (adding oxygen). Insufficient oxygen levels in your lake/pond can lead to poor water chemistry and impair your lakes fishery. Aeration systems create bubbles as small as 0.5 mm in diameter that form an ultra-wide column of upward moving water. This upward water “turns the lake over,” allowing oxygen to be absorbed at the lake’s surface. Aeration systems continuously lift bottom water to the surface where gases are expelled and oxygen is absorbed. This allows colonies of beneficial bacteria to once again flourish along the bottom of the water. Nutrient levels decline and water clarity increases. Oxygen-related fish-kills are eliminated, sports fisheries are improved, and fish can expand their territory into the formerly oxygen-deprived portions of the water. If aeration is right for your pond or lake, it is important to choose the correct sized system. You will need to select the size of the compressor as well as the number of diffusers. Smaller ponds (less than 1.5 acres) can typically use 1/4 HP compressors. Larger ponds or lakes may need 1/3 HP, 1/2 HP, 1 HP or even larger compressors. The type and number of diffusers will depend on the area you need to aerate and the amount of circulation required. Contact us if you need assistance with determining the correct aeration system for you. Aeration is an effective, natural, environmentally safe solution to the problems of algae build up, aquatic weeds, bottom sludge, and aquatic odors in lakes and ponds. Aeration is the preferred method of water quality control because it effectively attacks the causes while other methods simply treat the symptoms. Two methods of aeration are Aerating Fountains and Bottom Diffused Air System. Aerating Fountains, also known as surface spray aerators, create a vertical circulation under the water to depths of 6 to 8 feet. This circulation helps mix the thermal layers of the water. This is important since cooler water can absorb more oxygen than warmer water. Also the oxygen entering the water at the surface needs to reach the bottom where the beneficial aerobic bacteria utilize it to consume excess nutrients. Aerating Fountains offer a secondary effect, an aesthetically pleasing spray pattern which also provides a benefit. As the water droplets hit the air they absorb oxygen which is than transferred to the body of water when they hit the surface. This creates wave action which helps with additional oxygen absorption by increasing the surface area of the body of water. This also aids in deterring insect infestations by minimizing stagnant areas of water. Bottom Diffused Air Systems provide a similar vertical circulation under the water, however, they are effective in depths up to 35 feet. Compressed air from a shore mounted compressor is carried through weighted tubing to membrane diffusers at the bottom of the body of water. These membrane diffusers use micro-bubble technology to synergistically lift cooler bottom water to the surface where oxygen is absorbed and then transferred throughout the water column. A water boil at the surface is the only visual effect the will be noticed when using Bottom Diffused Air Systems. In conclusion, both Aerating Fountains and Bottom Diffused Air Systems are effective aeration tools. Pond or lake size and depth along customer needs will determine which system will be the best fit for each site.